This book includes all the important ingredients of Christmas: flour, currants, brown sugar and cinnamon… and a touch of Christmas Spirit. Mr Darcy’s friends are back in a new story. They all meet for Stir-Up Sunday, working together to make Mr Darcy’s famous Christmas pudding. With the help of his friends, Mr Darcy also learns that the Spirit of Christmas is about more than just Christmas pudding. Forget buying an Advent Calendar this year. 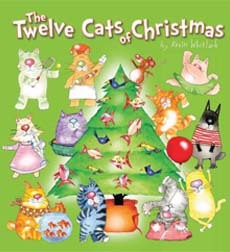 This book is all you will to countdown to Christmas, especially if you are fond of sharing classics with your children. The collection features 24 stories, mostly Christmas classics written by some of our most recognised writers (e.g. Charles Dickens, Hans Christian Anderson, The Brothers Grimm and Leo Tolstoy). The stories are illustrated by Tony Ross and are summarised in a pictorial calendar at the beginning of the book. Amelie and Nanette get into the spirit of Christmas, baking, crafting and preparing their fairy costumes for their school Christmas party. When Nanette gets sick and can’t attend the party, she is heartened when she receives a sack full of cards from her school friends who missed her at the Christmas party. Little Dog gets lost on Christmas Eve. He walks past many Melbourne landmarks in his efforts to find his way home to his best friend, Jonathan. This one is a true and historical Australian Christmas story that will warm the cockles of your heart and help you remember the wondrous Christmas is for children. Tea and Sugar Christmas is based on the Trans-Australian Railway train that would travel across the Nullarbor Plain servicing settlements with provisions, meat, medical staff and bank services. Once a week settlers could fill their wheelbarrows and stock up, and once a year Santa would ride the carriages and bring gifts for each of the children. Black and white pages fold out to reveal exquisite large-scale colour illustrations by renowned illustrator, Robert Ingpen. The book features photos and images taken during the Sugar and Tea Train era. It truly provides an insight into an interesting aspect of Australian history. Characteristic of many of Peter H Reynold’s stories, The Smallest Gift of Christmas is a simple tale of true meaning. Young Roland gets caught up in the materialistic expectation of gifts at Christmas time, but he soon learns that sometimes we can overlook our biggest and most important gifts when we focus too much on the trivial size and volume of gifts we receive at Christmas time. Helpfulness is rewarded in this sweet story about a mouse who lives in a threadbare house. While out looking for a Christmas tree, Matilda frees Santa who has found himself stuck in the forest. The next morning Matilda wakes to a beautiful Christmas tree, a stocking full of presents and a personalised note from Santa. My Merry Christmas is part of a series that includes My Mum’s the Best and My Dad’s the Coolest. I tis a great book for very young children as it features a handful of simple sentences about preparing for Christmas and endearing illustrations of animals decorating branches, gathering food and singing carols. This is such a special, meaningful story for Christmas time. A small, plain, little bear sits lonely on the toyshop shelf watching the other toys get purchased for Christmas gifts. But he is in for a lovely surprise on Christmas Eve because sometimes the most loved toys are not the fanciest or the most expensive. This is a book that instils the notion that Christmas is more about community than material objects. It is beautiful too, from its embossed jacket flap to its variety of illustrations printed upon matte paper. The story is about a giant and an elf who enjoy creating the wrapping paper for Santa’s gift each year. One particular year they are asked to also grow the Christmas tree for the town, and when it goes missing they use their wrapping paper and work together to create a beautiful, new tree. The underlying message in Just Right is that joy can be found in giving and that Christmas is a time to give to those less fortunate. The story is about a soft, red and Christmassy roll of fabric, which has a life that keeps giving. Each new character who stumbles across the fabric remnants (from a king to a mouse) creates a handmade gift for someone special until every last bit of the fabric has been used. No matter whether big or small, each hand-made gift is just right and received with love. Publisher’s Description:A magical Christmas tale about a selfless young girl and her inspirational wish. Lily has a special Christmas wish, but only one person can make her wish come true. She writes him a letter and another and another. He writes back, but will he grant her wish? Do you believe he can? This could easily be a story of a parent as they watch the joy Christmas brings their child, but this is the story of a beloved toy. A toy sheep watches his owner closely as she gets ready for Christmas: wrapping presents, making Christmas cookies, decorating the tree, acting the nativity play, making cards, trying to sleep on Christmas eve, opening presents, sharing gifts, and saying ‘I love you’. As usual, Tamsin Ainslie has created endearing illustrations to match this delightful story that captures the anticipation and joy of Christmas traditions. Ollie loves wrapping presents, making decorations and listening for Santa’s sleigh bells! 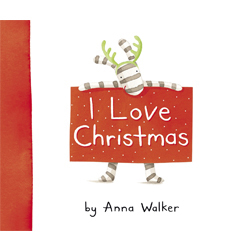 The magic and excitement of Christmas are brought to life by Anna Walker’s whimsical rhyming texts and gorgeous illustrations. With rich oil paintings, Lucy Hennessy has illustrated a contemporary Christmas story based on the traditional legend of the Christmas Rose and featuring symbols and characters from the tradition Nativity story. A unique perspective on what happened in the stable on the very first Christmas Eve. Every farmyard animal has a special purpose on Earth, and in Penny Matthew’s latest Christmas tale they all date back to one magical Christmas Eve night many, many years ago when a special baby was born: Donkeys are strong and reliable workers, dogs and cats sit at the feet of humans for comfort, geese provide feathers for pillows, sheep provide wool for baby blanket’s, spider’s decorate with webs, doves sing babies to sleep, hens provide breakfast, cows give milk, and roosters are first to give news on Christmas morning. When Suzy Goose decides that the Christmas tree is missing a star, she sets off on a journey to fetch the shiny star in the sky. No matter how far she travels, she never reaches it. But when she finds herself back at the tree, everyone has a beautiful Christmas surprise! Beautifully illustrated, this book tells the timeless story of Christmas. This is a beautiful Australian interpretation of the nativity story written with charm and superb prose. The Shepherds are a neighbouring family; the three wise men are replaced by three elderly aunties who bring plum pudding, shortbread and a crate of fruit; and the heralding angels are exchanged for a flock of cockatoos. Applesauce, a pet pig, tries to find the true meaning of Christmas as he watches over the bushfire- ravaged land before him. As his owners welcome a new baby to their family he learns that new life, hope and joy can come at the saddest of times. Robert Sabuda’s paper engineering is breathtaking. Each page of this mini book features one letter from the word C-H-R-I-S-T-M-A-S. The letters are symbolised by objects synonymous with Christmas. Toy, manger, Santa are just a few. Although delicate this is a beautiful book to share with young children to help them learn their first Christmas words. Exquisite silhouettes and a spectacular pop-up finale bring this popular Christmas poem to life! This countdown story features festive illustrations and rhyming phrases. The story sees Santa’s reindeer disappear one by one as they prepare for Christmas. Full of Christmas themed jokes, this would make a wonderful first joke book for children. Full page illustrations for each joke and answer help children to understand some of the puns and homophones used in the jokes. Where’s Santa? Around the World is another masterpiece from Lois Shea. There are over 600 things to spot in the illustrations, but there’s also a great comic style story to follow through the book. Santa and Mrs Claus are set to enjoy a cruise around the world, as long as Naughty Nat doesn’t sabotage it. This is a Christmas book that will make all family members giggle. Everybody loves Christmas time, but for Mothball it’s still all about scratching, sleeping and carrots. Only Mothball the Wombat could ignore all the Christmas festivities in favour of carrots. She finds a cosy place to nap aboard Santa’s sleigh and finds herself travelling the world on Christmas Eve. She battles reindeers, pigeons, toucans and polar bears for carrots but arrives home feeling completely satisfied and looking forward to the reindeer’s next visit. Worried about the snow storm and whether Santa will make it, our young narrator is only puzzled by the funny thing his family are saying. He has mum telling him that “we’re going to have to work our tails off to get ready for Christmas tomorrow.” His sister whispers to him that “Santa will probably get stuck at the North Pole.” Grandpa tells him that “time moves at a snail’s pace when you’re waiting for something.” Thankfully his Dad re-assures him that “Santa will go to the ends of the earth to find you”. This is a funny Christmas tale full of amusing idioms. Serge Bloch’s illustrations amusingly highlight the absurdity of these commonly used phrases. A great book for lovers of I Spy and Where’s Wally? Elvy the elf has lost all of Santa’s Christmas essentials including the sleigh, toy sack, milk and cookies. And it’s the readers’ job to find them in each of the ten scenes in the book. For fast little spotters, there’s a whole lot more to look for on each page too. It is a perfect book for the holiday season too, keeping the kids entertained for hours. Another great book for kids that love to play I spy. Santa’s been on a diet and his baggy, old pants have fallen off. Starting at The North Pole, there are 12 scenes in the book, and you need to find a different pair of Santa’s pants in each one plus all of Santa’s reindeer. I think I lack the patience to successfully complete these types of tasks, so I’m thankful to find answers at the back of the book. This is a lovely I Spy book for younger children. Starting in the Toy Maker’s Workshop there are 12 photographs and a checklist of items to search for in each photograph. Not only is there fun to be had in searching for the objects but children get to learn the process of toy making. After the workshop, the toys get a lick of paint before being displayed in the window. Once purchase they’re given as a gift, left in the attic, sold at a yard sale and sent in for repairs. Can You See What I see? Night Before Christmas is also available. The Jigs, a family of Pigs, put on a nativity play for some important relations who come to stay. It doesn’t all go according to Emma’s (the eldest child) plan, but Granny and Grandad are impressed nevertheless. Choosing and decorating the Christmas tree is top of Fancy Nancy′s list and it has to look just perfect! But in all the excitement disaster strikes and Fancy Nancy′s most special decoration gets broken! What will go on the top of the tree now? Grandpa steps in just in time and with his help and a LOT of glitter, ribbons and tinsel, Fancy Nancy manages to create a very fancy alternative! This is a funny comic-style picture book featuring Santa and his pet dog, Bobo. We love its different take on Santa Claus. Each year Santa gets caught up reading letters, making toys and keeping an eye on his elves that he forgets his washing machine needs to be fixed. When Christmas Eve arrives and he can’t find his suit, Bobo reminds Santa that it’s in the laundry basket, where it’s been for a year, waiting to be cleaned. With no time to hand clean the suit, Bobo makes him a brand new suit using curtains and Santa promised to fix his washing machine when he gets home from delivery toys on Christmas Day. It’s Christmas time and all the dogs are busy getting up to hilarious mischief and decorating the Christmas tree. With fresh, funny drawings, this interpretation of the classic rhyme will have kids giggling through twelve dogs digging, eight canines skating, and nine labs licking, right back down to a fat cat in a fur tree. The purr-fect book for cat lovers. With fresh, funny drawings, this interpretation of the classic rhyme will have kids giggling through nine pussycats playing, seven Siamese sailing and two tomcats twisting, right back down to a fat mouse in a fur tree. Olive thinks she is a reindeer, and while Santa and the other reindeer are a bit surprised that a dog wants to join the their team, in the end Olive and her unusual reindeer skills are just what Santa and his veteran reindeer team need. A beautiful hardback edition of Clement C. Moore’s famous poem, ‘’Twas the Night before Christmas’, with a musical and narrative CD featuring Peter, Paul and Mary. The illustrations are vibrant and doll like. There are many editions of this story and each of them is certainly beautiful, but Robert Ingpen brings splendour to the poem with his magical illustrations that fill the reader with both warmth and excitement. Publisher’s description: It’s Christmas Eve, and most people are safely tucked up in their beds. But the Christmas angels know who needs their help on this holy night, and are ready to fly down to help the lost, lonely and weary. Small children will love the row of cut-out angel heads which reveal the features of each little angel in turn. This is a beautiful and inspiring picture book which sings of the message of Christmas loving kindness from every page. Like all her books, Alison Jay has intertwined and connected the crackled illustrations in each page, giving children a beautiful visual path to follow as you read (or sing) this Christmas classic. Publisher’s Description: With a sprinkling of festive, illustrative magic, Jane Ray has created a timeless version of this traditional Christmas verse. A beautiful classic in which Madeline helps Miss Clavel and her friends overcome their Christmas-time colds. A rug merchant brings magic to their old house in Paris, and the girls travel home on magic carpet rugs to surprise their parents on Christmas day. I love the Bruna book too. As a teacher, its text was also easy to adapt to a little performance for parents.